On to my Close Call. ...the last 8 hanks of the copper! Woooooo! Hooooooooo! And now I just need to find time to make it. Heh. This weekend would have been a good time (I actually got to relax and play!) except that I spent a lot of my knitting time doing geeky charty things with lace. I had a blast. I found this font from XRX (thank you David Xenakis, for including Macs!) and played with it. Knitting. Charts. Lace. Fonts. Spreadsheets. What could be better?! And an update to the Situation: all is well. Really. Dr. Destructo wants you all to know that he still lives here and we still love him. But, as Alison and I discussed, we have this little saying in common: "It's a good thing you're so cute!" The cut yarn was removed from the cone, the ends put back together fairly well (if I do say so myself!) and the sample in question was completed and sent off. One of these days, you will even see it! Whew. That's great that everything worked out okay with the yarn disaster! The coppery color is gorgeous - so much subtle play of shades going on there! And the yarn itself looks like it'll be lovely to work with. Yessss! Snatching up a big pile o' discontinued yarn is so gratifying. Congrats on the score. We have a similar saying in my house: "Thank God you're pretty." 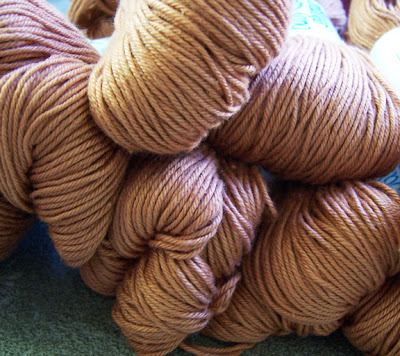 The copper yarn looks great. Is it just the photo or does it have gentle color gradation, sort of a hand dyed look? Anyway, congrats on the yarn find, I think that's a pretty cool color! Woah, how great! That's the good thing with orange indeed ;) Congrats on this score! nice save on both yarns! I'm so glad you lucked out on the copper yarn!!! I'll have to check out the fonts. Always looking for THE one that will work for ME. Bonus! The Scottish in me is doing the Highland Fling (on your behalf)over your phenomenal score. See, now, aren't you glad you went with the copper? It looks lovely! Can't wait to see the WIP shots! Wonderful yarn color - would you mind sharing the colorway name / number? I'm trying to find out info online, but can't tell which color that baby geor-geous is. I'm very excited for you though!